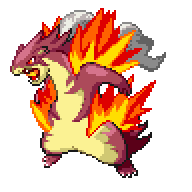 Typhlosion is a Fire-type Pokémon. It evolves from Quilava starting at level 36. It is the final form of Cyndaquil. 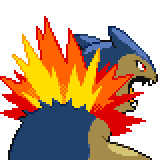 It can Mega Evolve into Mega Typhlosion using the Typhlosionite. 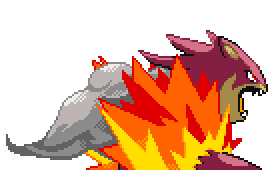 A level of "Start" indicates a move that will be known by a Typhlosion obtained at level 1. 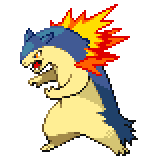 Typhlosion is the only final form of a Fire-type starter Pokémon that does not have a secondary type. By extension, this also applies to the Delta Charmander evolutionary line. 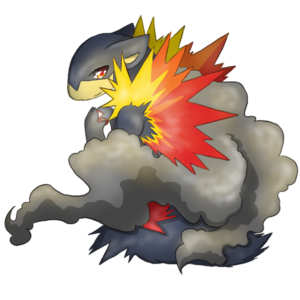 Typhlosion shares its species name with Quilava and Entei. They are all known as the Volcano Pokémon. 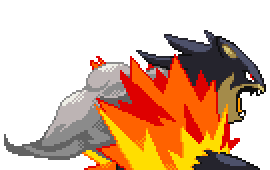 Mega Typhlosion has the highest base Special Attack of all Fire-type Pokémon. 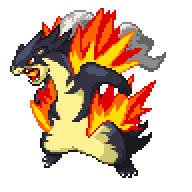 Mega Typhlosion has the highest base stat total of all non-legendary Fire types. 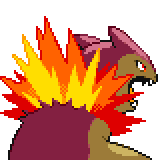 It also has the greatest increase in base stat total among Fire-type Pokémon upon Mega Evolving, receiving 101 points overall.